If your plant takes in too much water without proper drainage, the roots will rot and your plant-child will perish. Make sure your planter has plenty of drainage. Add a layer of gravel to the bottom of the planter to help with drainage if there are no holes. Many houseplants are tropicals, appropriated for interior use. Exotic tropicals evolved to thrive in the partial light received from beneath a thick forest canopy. If you're seeing random brown spots on your plant, it could be sunburn. Some plants, like herbs, prefer ample, full daylight. Cacti are extremely hardy and do well even in the partial sun indoors versus the blazing elements they evolved for. Succulents, however, no matter how trendy for indoor use, can be tricky to grow inside because they're desert plants that crave sun. Don't go with what's trendy-- go with what will live in your space. If your space is dim and humid, go for tropicals. Bright and sunny? Succulents and herbs may work for you. 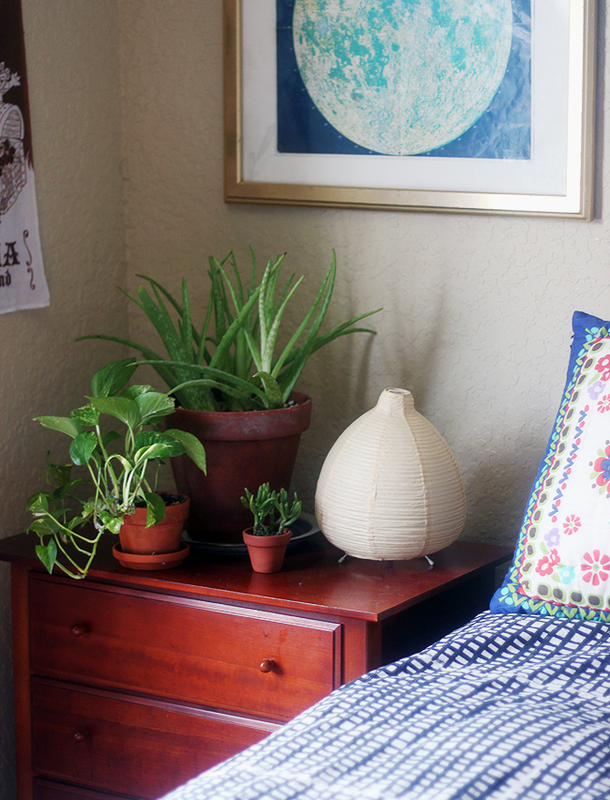 If you're a noted plant killer, start with a very hardy cacti. I'm dying to add some hanging plants to every room's corner! I will follow-up with plants for air purifying and hard-to-kill plant recommendations in future posts. Plants come from different biospheres around the world and require different soil types, humidity levels and moisture levels. Cacti prefer sandy, well draining soil. Herbs and vegetables need extremely rich nutritious soil to produce food. Look up what your plant's needs and deliver. Just like too much water, no water, of course, can kill. Water according to your plant's needs. Even your cactus wants a deep drenching (like a desert rain) every once in a while. 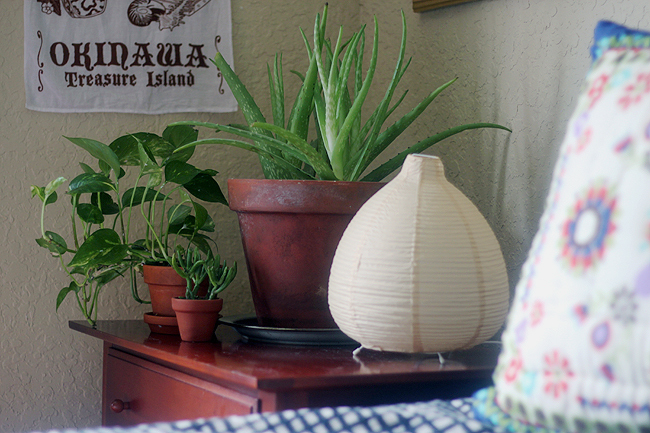 Your plant will eventually outgrow its home and need a new pot. Don't wait too long before upgrading your plant or it will become root-bound (the roots have no where to go in the pot) and die. I'll cover it in a future post, but some houseplants are idiot-proof in this regard because they don't mind being root-bound! (Cacti and succulents are in this camp.) When you transplant, don't rip at the precious roots! Would you like your toes ripped off? Shake the roots loose carefully and don't bury your plant's trunk below the soil line (unless it's basil or tomato, which can grow roots from the stem) or you could rot the stem/trunk. I hope this helps you fill your home with beautiful plants while keeping killing at a minimum. Even the best gardeners sometimes kill a plant; truly, all gardeners are accidental murderers. My beautiful tree from IKEA in this post bit the dust, and I've been growing since childhood. Remember, your plant baby may have been abused before you had it. Each one is a unique organism with its own quirks. Don't let mistakes discourage you from this beautiful, life-giving, planet purifying hobby. I come from a long line of gardeners and I'll never stop growing. It's such a pleasure to nurture a plant and watch it thrive. And if you believe dated interior design books that write-off a plant as simple decor to be replaced if it dies (tee-hee, their vapid tone reads) Poison Ivy will find you and smite you for that arrogance! Got any more questions or tips? Let's discuss in the comments. I'll be following up with plants for air purifying and my favorite die-hard varieties. I'm AWFUL at keeping houseplants. I honestly just forget about them so I stopped buying them. Try a cactus :) They like neglect and abuse. I think I'll do a round-up of plants that take extreme abuse. There are some un-killables out there.